Big is good, it’s official. As you hopefully know, power is generated in our car engines by burning fuel. The heat makes the pressure go up which pushes the piston down just like you foot bearing down on a bicycle pedal. It’s a nice simple theory. The trouble is that most of the heat released into the cylinder is wasted, at full throttle about a third goes into the coolant and the other third goes down the exhaust pipe. At part throttle its even worse, up to 90% of the heat is wasted. A small fraction of the exhaust energy can be recovered with a turbo but basically it’s very wasteful. So how can we improve things? Well, to retain more of the heat energy in the exhaust we can reduce engine speed, allowing longer for the heat to be used. But how can we reduce the heat absorbed by the cylinder wall? We could use some funky materials like ceramic but that has its own problems. However, one fundamental scaling rule applies to all things in the universe, if you double the volume of something, the surface area only increases by about 1.4. This is good for engines because a smaller proportion of the heat is lost to the cylinder walls. It’s not so good for creatures that breathe through their skin, like spiders which can never get much bigger than your hand without collapsing in a heap. So why not use massive engines everywhere? Of course the efficiency bonus of big engines only applies at high loads, at part throttle the massive cooling effect of a high surface area ruins the fuel economy, so in the car world we size an engine to be appropriate for the job the car is supposed to do. For instance, when cruising down the motorway most cars only need about 18 bhp, so building a small engine that has peak efficiency at that power would be great for that single job, and indeed that is what the ‘mileage marathon’ cars do, but of course there is nothing left in reserve for accelerating, so we go for something closer to a 100bhp engine in a smallish car. But what about something bigger? The biggest vehicles produced are ships, and in particular supertankers which can be the length of a drag race track. 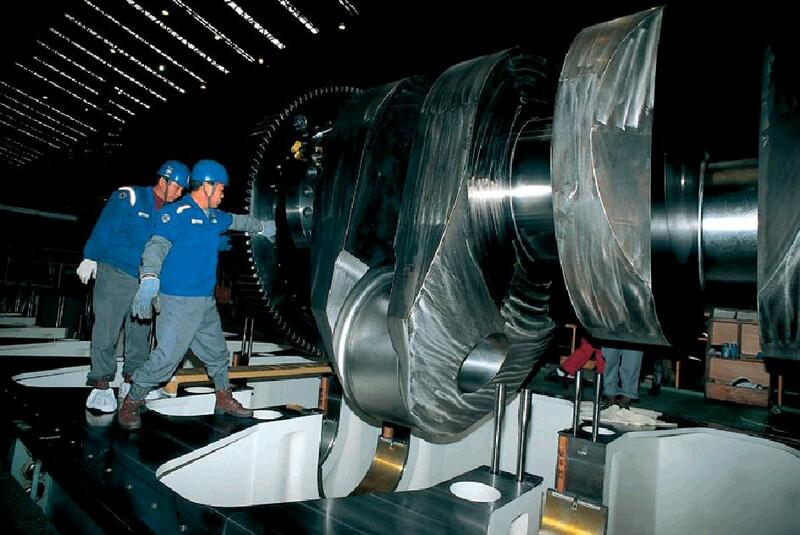 So the subject our adoration is the mighty Wärtsilä-Sulzer RT-flex96-C, in particular the 14 cylinder version. Its total cylinder capacity is 25480 litres, I’ll just let that sink in for a moment. It is a two stroke diesel engine with four, very large, turbos and computer controlled poppet type exhaust valves. It gobs out 84.4Mw which is 114800 bhp at only 102 rpm, and as you probably know torque is power divided by speed, that equates to about 6 million lb/ft of torque. Which is a lot. Fuel economy is brilliant at full load – amazingly only 171 grams of fuel per kWh, ok that might not mean too much to most people but it is about twice as good as a diesel car. But if you drop the load to 85% and best efficiency the consumption is only 163g/kWh, which with the fuel containing 42.7 Mj/kg relates to about 51.7% efficiency. But this is not the best efficiency in the piston world, I think that is the Man S80ME-C7, catchy names. Everything about it is big in a whole new way; each cylinder is 960mm (37.8 inches) bore by 2500mm (98.4 inches) stroke, giving 1820 litres per pot. At full tilt, 102 rpm that is, a mean piston speed of 8.5 meters per second and the average pressure in the cylinder (MEP) is about 20 times higher than atmospheric which all means that each individual cylinder produces over 7700 bhp (the same as a top fuel drag race car) whilst consuming about 160 grams of heavy smelly fuel oil each stroke. The outside is even more impressive, they call this type of thing a ‘cathedral engine’. At nearly 14 metres tall, 28 metres long it has four stories of walk ways round it. And weighing in at 2300 tonnes its not going to fit in a car! Even the fuel pump is impressive, it looks like a huge V8 designed by Dr Frankenstein and delivers up to 1660 gallons per hour of heated fuel oil at 1000 bar to the common rail diesel injection system. Each cylinder has three injectors which are operated independently to control the combustion flow, the way the flame moves around the chamber, resulting in no smoke even at full load. The fuel control allows the engine to run over a wider range of speeds than older generation engines, indeed on the 12 cylinder version they managed to get it to run at only 7 rpm experimentally, that’s one ‘kaboom’ every 9 seconds, which is very slow. It uses, more or less, the usual two stroke block scavenge intake system, that’s where the underside of the piston compresses the air. But that’s as far as normality goes, here it is refined with one way valves the size of tea trays and then the air hits four very impressive turbos, each the size of a small garden shed, before going through inter-coolers the size of Portacabins and entering the cylinder via a port near its lower edge. For starting, massive electric blowers pump in air at about 30 bar. The exhaust poppet valves are fully computer controlled, a servo uses oil at 200 bar to move the valve up and down, so the cam profile exists only as software in the virtual world of the control box and is totally variable. The exhaust valve opening is reduced at part load to keep the exhaust temperature above 150 ºC to prevent tons of sulphur from the unrefined fuel corroding the exhaust after treatment system. The pistons are mounted solidly onto an upper con rod, called a piston rod, that has a joint at the bottom that runs in guide rails, to keep the piston rod upright all the time. It’s called a cross head and ensures that the piston has no side loading and the oil control is tight enough to give the engine a 30 year service life, and most of the time in all those years the engine will be running flat out, which is pretty amazing. The lower end of this rod connects to the con rod proper and then on to the crank, the main bearing caps have ladders on them for the service crew to walk up. Did I mention it’s quite big? 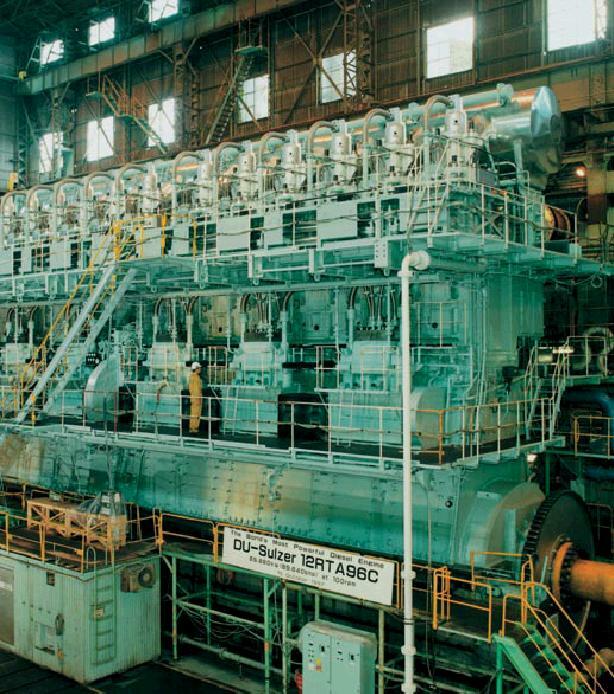 These engines are used in container ships like the Emma Maersk, about 170 thousand tons of it which is propelled at up to 26knots and is assisted by no less than five 8000 bhp Caterpillar engines just for helping with manoeuvring. It’s got quite a big propeller too.